Maze release date was Friday, March 22, 2019. This was a Limited in theaters release. 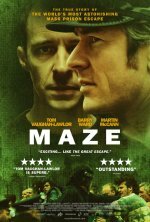 Based on the true story of the biggest jail break in Europe since World War II, Maze is a thriller that follows the relationship between two men on opposite sides of the prison bars. The film charts how inmate Larry Marley (Tom Vaughan-Lawlor) becomes chief architect of this daring escape, which freed 38 Northern Ireland Republican political prisoners. Standing in his way is HM Prison Maze, one of the most state-of-the-art and secure prisons in the world – a prison within a prison – comprised of a labyrinth of H-shaped buildings encased in even higher concrete walls. While attempting to pull off this unimaginable feat, Larry comes into close contact with prison warder Gordon Close (Barry Ward). Although based on deception and manipulation, the trust that these two men develop becomes symbolic of the peace process that eventually resolves the Northern Ireland conflict.